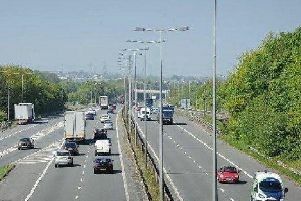 A full weekend closure at junction 27 of the M6 looms as road improvement works to the roundabout above the motorway. Work is currently under way to improve cycling facilities at the A5209 Crow Orchard Road roundabout, located above the M6 at Junction 27. As part of this, a full weekend closure will be required on Saturday November 24 and Sunday November 25. A spokesman from Highways England said: "A full weekend closure will also be required on the A5209 Crow Orchard Road eastbound, between the junction of B5250 Mossy Lea Road and South Whiteacre. "This is required to carry out a full carriageway reconstruction. "All our improvement work is carried out with the aim of causing as little disruption." The junction is used daily by thousands of motorists traveling from the likes of Chorley, Preston, and Wigan. The work includes enhancing existing pavements to a shared footway and cycleway, installation of new push button crossing facilities, improvements to lighting columns, installation of new signage, landscape improvements and surfacing. The scheme is due to finished early in the New Year. Work is taking place between 10pm and 5am each night and involves lane closures on the approaches to the roundabout and slip road closures at junction 27.